More than 20 Egyptian rights groups have called on President Mohammed Mursi to withdraw the decree granting himself extensive new powers. The 22 groups signed an open letter saying the president "has dealt a lethal blow to the Egyptian judiciary". Opposition politician Mohamed ElBaradei has said there can be no dialogue with Mr Mursi while the decree, announced on Thursday, is in force. There have been big rallies for and against Mr Mursi's move. The Muslim Brotherhood, which backs Mr Mursi's Freedom and Justice Party (FJP) party, has called for demonstrations across Egypt after sunset, in support of his decree. The Islamist movement has called for a one-million-man march to be held at Abdin Square on Tuesday, the Egyptian news agency MENA reported. Opponents of the decree have also called for demonstrations on Tuesday. According to the decree, no authority can revoke presidential decisions. It includes a bar on dissolving the assembly drawing up a new constitution. "These actions undermine the rule of law and the pillars of justice and exploit presidential powers to protect the interests of a particular political group," said signatories to the letter posted on the Cairo Institute for Human Rights website. "The president, who now possesses authorities beyond those enjoyed by any president or monarch in Egypt's modern history, has dealt a lethal blow to the Egyptian judiciary, thereby declaring the beginning of a new dictatorship in which it is not permitted to oppose the president, criticize his policies, or challenge his decisions." 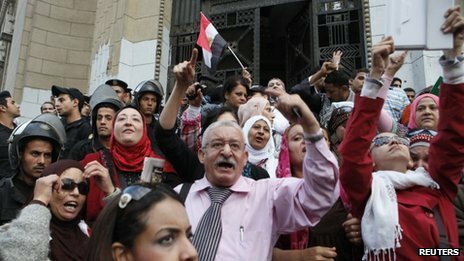 The announcement of the decree sparked angry demonstrations and attacks on FJP offices. On Saturday, Egypt's judges denounced the decree as an "unprecedented attack" on the judiciary. After an emergency meeting, the Judges' Club - the union which represents judges throughout the country - called for "the suspension of work in all courts and prosecution administrations". Police fired tear gas to disperse crowds as supporters of the judges faced off against pro-Mursi demonstrators who tried to disrupt the meeting. There had been reports that the Supreme Judicial Council was about to disband the constituent assembly for a second time, says the BBC's Jon Leyne in Cairo, a move that could seriously derail the transition to democracy and further delay new parliamentary elections. This, in turn, could deter Egypt's political leaders from taking tough decisions while they wait for the vote, our correspondent says. Work on the constitution has been plagued by legal complaints questioning the make-up of the assembly. Mohammed Mursi became the fifth president of Egypt in June - more than a year after protests that overthrew President Hosni Mubarak. The US and Germany have expressed concerns about Mr Mursi's decree.